Last Sunday we (me, my sister and my obelad gf) went to have dinner at Jalan Ipoh Restaurant Hou Hou Steambot (好好生锅). As I’ve promised my obelad to spend her to eat crab, this is the day she redeem the promise. We order 3 set of standard pack and 2 egg crab and 1 meat crab. All together cost me around RM 70. The egg crab is really really nice, but bcoz the soup is too nice, I cant really taste the sweetness of the crab’s egg. The size of the meat crab is big! 1 meat crab is equivalent to 2 egg crabs. The meat is fresh! When i put the crab into the soup, the crab still moving!!! 阿密陀佛! 善哉! 善哉! So this is the photo that we almost finish everything. So thats IceQueen lah~! Muahahah…. jason: she 生虫. 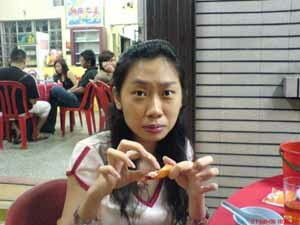 got many parasite in her body so tat’s y so skinny lo.